The definition of a pilgrim is a person who travels somewhere for religious reasons. 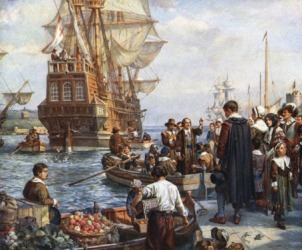 An example of a pilgrim is an English Puritan who came over to Plymouth Massachusetts on the Mayflower in 1620 to escape religious persecution in England. An example of a pilgrim is a person who travels to Israel on a religious mission. "pilgrim." YourDictionary, n.d. Web. 09 April 2019. <https://www.yourdictionary.com/pilgrim>. A religious devotee who journeys to a shrine or sacred place. A person who travels, especially to foreign lands or to a place of great personal importance. Pilgrim One of the English Separatists who founded the colony of Plymouth in New England in 1620. Middle English from Old French peligrin from Late Latin pelegrīnus alteration of Latin peregrīnus foreigner ; see peregrine . One who travels, especially on a journey to visit sites of religious significance. (intransitive) To journey; to wander; to ramble. Middle English (early 13th century) pilegrim, from Old French pelegrin (11th century), from Latin peregrinus (“foreigner") (English peregrine (“wandering")), a derivation from per-egre; see per- + agri (“field, farm") (from which English agri- (“farming")). The change of -r...r- to -l...r- is an effect of dissimilation in early Romance; compare Italian cognate pellegrino. A settler of the Plymouth Colony. Usually used in plural. (soccer) someone connected with Plymouth Argyle Football Club, as a fan, player, coach etc. "Lord Jesus Christ!" exclaimed the pilgrim woman, crossing herself. High, representing the Pilgrim Faith. All were silent, only the pilgrim woman went on in measured tones, drawing in her breath. Commissioned by Mehemet Ali to inform him about the situation in Nejd brought about by the rising power of Abdallah Ibn Rashid, Wallin left Cairo in April 1845, and crossing the pilgrim road at Ma`an, pushed on across the Syrian desert to the Wadi Sirhan and the Jauf oasis, where he halted during the hot summer months.